Phi Phi Hotel Deals are on everybody's minds when they look into booking a hotel for Ko Phi Phi. It is the hunter in us all that so loves it when we get a cheap deal. There is nothing quite so satisfying like getting a bargain, or a one-off discount when we pay out for our accommodation so it's good to be up on what is possible. phi-phi.com has the definitive list of Phi Phi Hotel Deals that give you Free Night Specials, Fixed Night Promotions and Long Stay specials on the guesthouses, hotels and resort on Ko Phi Phi Don. The website has worked with all the hotels since 1995 and earlier, when the business was still a travel company based on the island. In all this time the owners have built up excellent relationships with the guesthouses, hotels and resorts and are able to offer some exclusive deals. Phi Phi doesn't have all the deal types that happen with Koh Samui Hotels but it does have some very interesting ones that are a good first stop before you go too search too far. The Luxury Phi Phi Hotels include the Phi Phi Island Village Resort And Spa, Holiday Inn Phi Phi Island, Zeavola Phi Phi Resort and Phi Phi Island Cabana Hotel. Saving in these hotels will make substantial savings. When you go to these Luxury Resort fact pages you will see the Specials Buttons on the top right navigation and these will lead you to every deal available to that hotel. Check the month as the deals vary quite a bit between the high and low season. Phi Phi Hotel Deals are everywhere in low season as prices are reduced because of the weather. From May to October 1st prices come down 30%, 40%, 50% in all hotels, resorts and guesthouses on the Ko Phi Phi Don so if you time your arrival right you get a massive deal. Low season isn’t all wet and windy for every day and May, Mid July and August have a lot of excellent weather, sometimes as good as high season. These weeks and months are perfect travelling times to get good deals. Even in June and September it will not be raining all the time though there is regular wind. Phi Phi Don Hotel Deals are offered on mass during this low season with Free Night Specials and Fixed Night Promotions being prevalent. There are fewer Ko Phi Phi Don Hotel Deals in high season as the islands are often full for large amount of time. When the islands are full there is no need to offers deals to customers. However the luxury resorts will still have their honeymoon deals which act as their good will. Thai people and hotel management appear to love romance and honeymoon deals are common. Peak season on Ko Phi Phi (20th December to 20th January) is intense in that most of the days the resorts on Phi Phi Don will be full. There are few Phi Phi Deals except the Long stay special given by phi-phi.com and hotelatm.com. hotelatm.com has a deal for all hotels in Thailand. 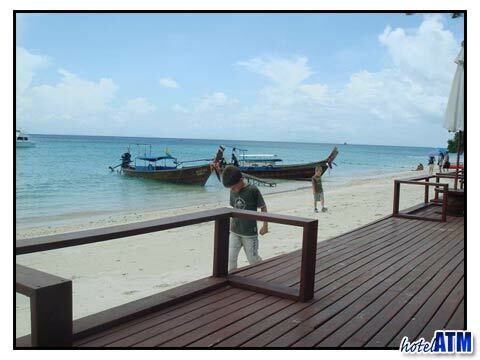 Long Stay Special works all year and is a great Phi Phi Deals for Guesthouses, Hotels and Resorts. If you are staying 15 days or more on Koh Phi Phi Don (and in fact anywhere in Thailand), it will give you one day free, even in the peak season. This comes in handy when nothing else is available. This apply during high season, peak season, Christmas, New Year, Chinese New Year and Songkran.